Fall has arrived but San Francisco has been surprisingly warm these couple of days. I'm a big fan of neutral colors since it pairs easily with almost everything. Just throw on a scarf with a pair of printed heels and you have a simple and chic look. Here are my current favorites! It was pretty warm this weekend so this was a perfect outfit for a stroll in the city. Sweater cardigan from Aritzia is my all time favorite that I've had for years. I paired it with my ankle jean (it has zippers on the side) that I snagged for $25 from Banana Republic. The size Petite 25 is true to size and fits perfectly. My infatuation with lace is again seen here, the distressed jeans gives it some contrast. Another one of my favorites is this H&M jacket for only $35! It looks like a million bucks and it keeps me fairly warm. My Sam Edelman leopard print heels that I got from the Nordstrom Anniversary sale is making me not want to wear flats ever again. I walked around downtown for a couple hours and they were quite comfortable! 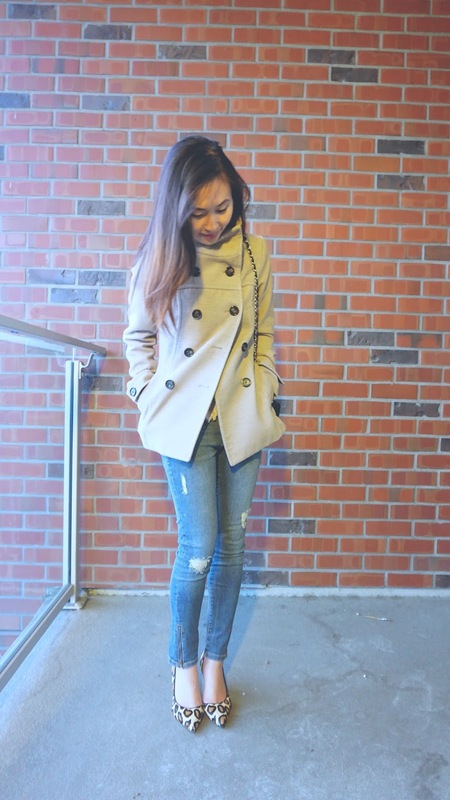 Throw on a scarf (Forever 21) and I have another outfit for the upcoming cold weather!